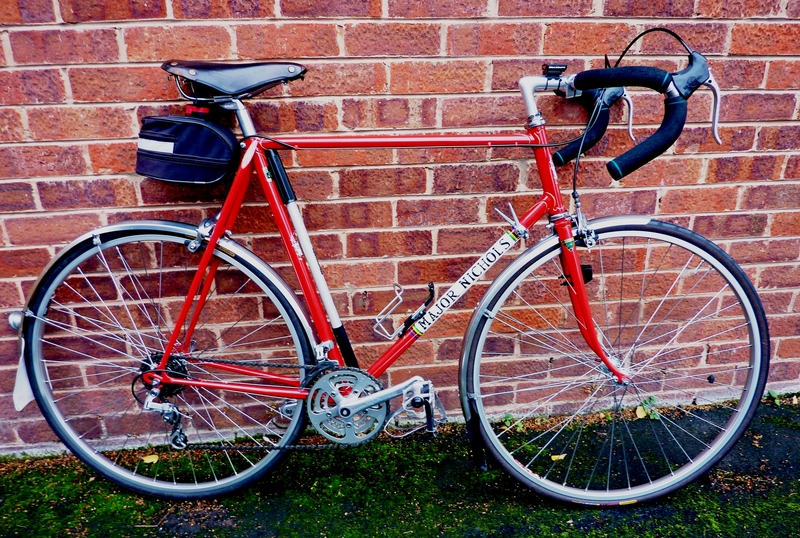 This Post Office Red machine (Major’s favourite colour) was custom built for Brian Nicholas of Hereford Wheelers in 1978. She had been hidden away in Brian’s shed from 1995 until 2010 when Bill bought her. Bill had the frame refinished and equipped her with the early 80’s equipment she boasts today as a bike of her time. The frame geometry looks interesting, quite a steep steerer and an easier seat tube angle. The wheelbase looks quite short and there are small tolerances for mudguards and toeclips. The build uses Prugnat 62 series long spearpoint lugs I think and a nice fork crown seen on some of his racing machines that I have not yet identified. The seatstay panel decoration on the full wrapover sets this frame apart. It has what I call the wheatsheaf motif. It is on some pre 1970 MN machines notably a 1954 example. This motif was also used by a couple of other frame builders. My belief is that he also used it on frames from a builder sent to Major to be finished in another name.